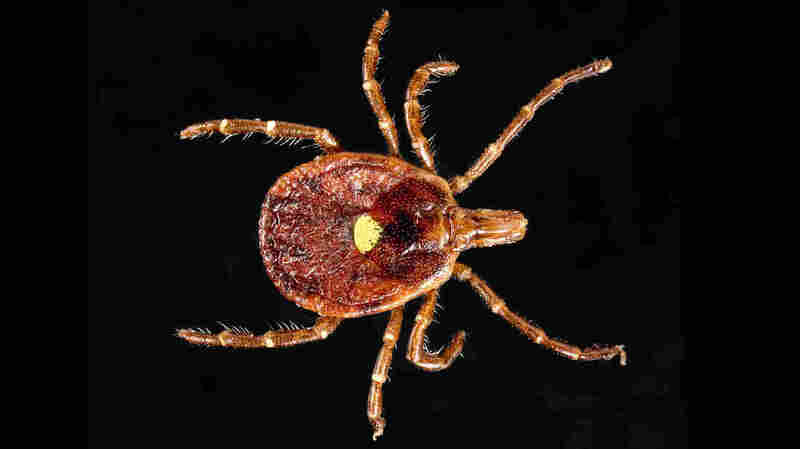 The Lone Star Tick May Be Spreading A New Disease : Shots - Health News An uptick in cases of Rocky Mountain spotted fever might actually be due to a newer tick-borne bacterium. It looks like it's causing milder infections — and a lot of confusion. "It's super, super scary," says F. Scott Dahlgren, an epidemiologist with the Centers for Disease Control and Prevention. "If you don't treat for Rocky Mountain spotted fever by the fifth day of illness, there's a really good chance you're going to die," says Dahlgren. "And it's an ugly, ugly death, too," he adds. "It's a horrific thing to go through and to see a loved one go through." "We didn't understand why people weren't getting so sick," says Stephen Dumler, a pathologist and microbiologist at the University of Maryland School of Medicine who started studying Rocky Mountain spotted fever in 1979. Rocky Mountain spotted fever is caused by a bacterium called Rickettsia rickettsii that lives in American dog ticks. For the last few decades, a different kind of tick typically associated with the Southeastern United States had been expanding its range north and west. It's called the lone star tick, and it's a bitey one. "The lone star tick is a very, very aggressive biter," says Dahlgren, lead author on the study. "It's extremely prevalent in a huge swath of the country." The ticks follow white-tailed deer populations, and warmer winters and multiplying deer populations likely allowed the tick to spread through the country. Now, says Dumler, who was not involved in the study, it's probably the most-encountered tick across the Southeast and Northeast. The new tick on the block likely brought its own set of bacterial baggage. About half of lone star ticks carry a bacterium called Rickettsia amblyommii. It's genetically very similar to the bacterium that causes Rocky Mountain spotted fever, but may not be pathogenic in people. Good news, right? After all, fewer people are dying from Rocky Mountain spotted fever. "It's not 100 percent good news because it's harder to find actual outbreaks of Rocky Mountain spotted fever," Dahlgren says. And it's an important one to monitor. Earlier this year, researchers in northwest Mexico reported that as many as one in five children who got the disease died from it. Also, Dahlgren says, the spread of the lone star tick doesn't completely explain the trends. "It's contributing to these changes, but there's obviously something else going on as well." He and his colleagues speculate that exposure to Rickettsia amblyommii may give people some immunity against Rocky Mountain spotted fever. "So, what we're thinking is that these little bugs might basically be vaccinating people against rickettsiosis," says Dahlgren. "Some bacteria look to our immune system like other bacteria," says Dumler, so exposure to a mild bacterium from one tick might prepare the immune system to attack a similar, more problematic one in the future. Dumler says it's theoretically possible, though there's no evidence for that so far in humans. A very small Oklahoma study took dogs on walks through tick-infested woods and then monitored what disease they got and how their bodies responded. Almost all of the ticks the dogs picked up were lone star ticks. Their blood contained antibodies against the Rocky Mountain spotted fever bacterium, but the dogs remained healthy. It suggests that exposure to the not-so-bad bacteria in the lone star tick might be able to protect the body against bad bacteria transmitted by the American dog tick. In humans, Dumler says, it's all still conjecture.